When considering how art and sustainability align in honor of Earth Day this April, arguably no artistic practice is more immediately connected to our planet than working with clay! Ceramicists have transformed earth into artistic marvels for millennia: along with cave painting, ceramics is the oldest art form existing on Earth – and is present in nearly every major world civilization since prehistoric times. While each culture has its own approach to working with clay, contemporary artists working with clay consistently find new methods for developing their own practice in ceramics, whether that consist of throwing clay, working with the wheel, or incorporating it into mixed media artwork. What about clay is so appealing to artists seeking out sustainable artistic methods to work within? Is working with clay really all that sustainable? What methods are developing for artists working in contemporary ceramics? Take a look at our deep dive, no pun intended, into the groundwork of ceramics in the 21st century. How sustainable is it to work with clay, really? Doesn’t it require firing clay vessels in kilns that demand extremely high temperatures? Are ceramic glazes safe, or can some be toxic for the environment? Luckily, strides are being made so that materials such as lead are not the only chemicals used in ceramic glazes. Out of concern for improving art and sustainability in the field of ceramics, a spate of non-toxic glazes have been taking root for artists, spurred on by artists who are concerned with environmental preservation. Also even though kilns do require significant amounts of energy to run, ceramicists often share kilns by firing their work together in ceramics collectives and/or in small groups to share the costs of firing equally. This proves to be not only the most economical approach to creating ceramic artworks but also – happily – the most sustainable method! 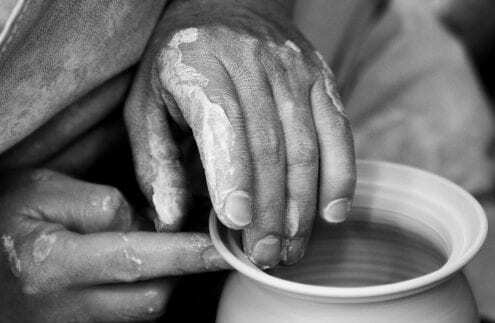 Besides feeling the textural quality of clay, guiding the earth through your fingers to form new artistic creations, running a ceramics studio can be a form of reward in itself for artists devoted to this elemental art form. For artists who run their own personal and/or joint ceramics studio, there lies an opportunity to create an art and sustainability-focused environment from the ground up! These helpful insights from Ceramics Art Network walk artists working with clay through concrete steps that can make the difference between a wasteful and waste-free working environment. Paying attention to small things like water level and keeping track of the state of your kiln can go a long way to ensuring that the artistic environment in a ceramics studio fully embraces environmental sustainability. Artists working in ceramics have the unique ability to use a nearly limitless material to transform their vision into creations at the borderline between art and sustainability, and by approaching this opportunity with complete awareness of best practices to preserve the natural environment they are giving back to the same Earth that sustains their own practice. Artists already working with clay likely naturally feel obliged to reduce their carbon footprint and adopt sustainable methods of art-making. Luckily, artists who are new to this artistic practice can take comfort in knowing that they are joining a much wider community of artists who have established tried and true methods of creating ceramics in dialogue with art and sustainability. From artist Kevin Morris’ interview with Craft Scotland to ceramic art and sustainability pioneer Robert Harrison, there are established and trusted voices in the field of ceramics who are measuring the impact that environmentally sensitive methods are having for ceramicists in the 21st century. Feel overwhelmed by the list of best methods featured in your research on ceramic art and sustainability? Don’t despair – incremental change is best, as if you rush too quickly to make updates to equipment and in your own artistic practice it is more than likely that old adage “haste makes waste” will apply to the works you create – you can save the environment by making the switch at the pace that works for you! Especially for artists who have spent decades working with clay, it can seem overwhelming to adapt to new standards in one’s practice. By re-educating yourself in best practices in contemporary ceramics, you can also impress on your collectors your dedication to re-orienting your work to be more eco-conscious, with a view to improving both your art and sustainability efforts. Working in ceramics is rewarding because of its immediacy – what you throw and fire is exactly what you sculpted with your own two hands. Understanding the chemistry and processes of working with clay can be intimidating, however. 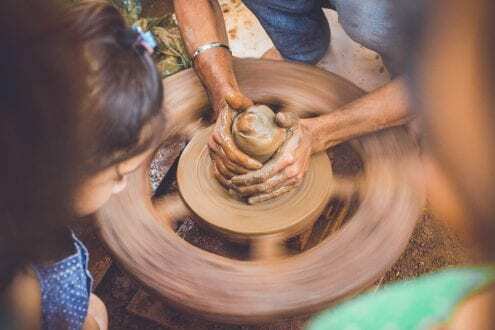 Before taking on the task of ensuring that you have a practice centered around principles of art and sustainability, you should make sure that you understand the basics of how to create with clay. What better way to ensure that you are supported in your artistic efforts than receiving insights from a network of artists and artisans working with clay? Groups such as the Ceramic Arts Network, run by the American Ceramics Society, and the International Ceramic Arts Network (ICAN) provide the potential for artists working with clay to gain feedback and advice from a wider network of professionals in the field. In addition, new avenues of showing your artwork and opportunities to gain prizes can result from becoming a part of these artist networks. Make sure you embrace the fundamentals of working with clay and you will be fully prepared to incorporate sustainable methods into your practice with confidence. Make sure you find a regular source of news to stay updated on the most current eco-conscious methods of working with clay available. Processes are consistently changing and evolving over time, and for artists who pride themselves on sustainability as much as they do their dedication to their practice, knowing the newest developments in environmental conservation, art and sustainability will go far to ensuring that your artwork embraces your goals to help create a better planet! Run a ceramics studio? Know more best practices for environmental conservation when working with clay that aren’t featured here? Share your insights with us in the comments below!